Holige sAru / Rasam is a very popular festival dish. 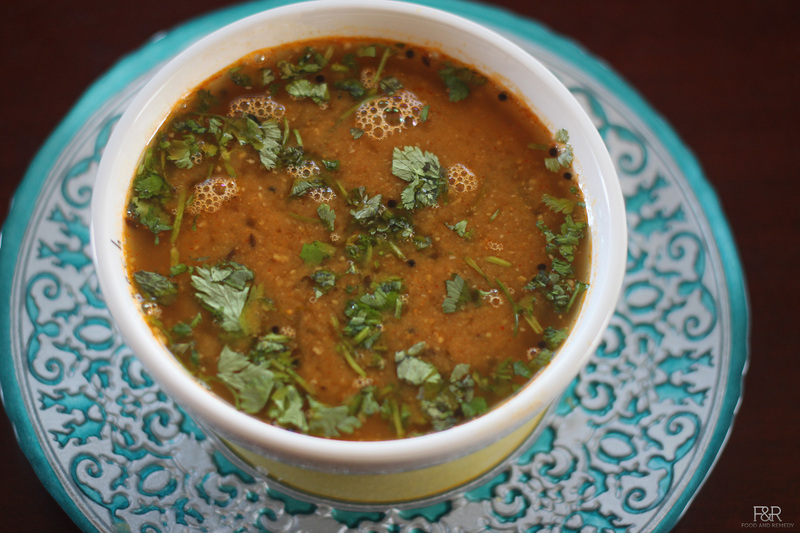 This rasam is generally prepared using the filling (hUranNa) which we make for obbattu/Holige. This hUraNa Rasam is a very traditional dish.Popularly known as obbattina sAru. Since we use the hUrana/filling for this recipe, please refer to “beLe Obbattu /Puran poLi recipe”. Though using huraNa from puran poLi is preferred, the rasam will still taste good without it. We are making rasam for 2-2.5 cups of water. If you have huraNa, simply grind coconut, rasam powder, salt, and tamarind along with the water to a fine paste. If you don’t have huraNa, add cooked dal, jaggery, and a pinch of cardamom to this paste, and grind. Add this paste to the cooked water. Add the filling/hUraNa (or prepared paste) and curry leaves, and mix well. Add the remaining water, keep it on medium heat, and let it boil. Continue adding water accordingly until we reach the desired consistency. Once you see the froth on top, turn off the heat and add chopped cilantro/coriander leaves. Heat the ghee in a ladle on medium heat. Add hing, mustard seeds, cumin seeds and let it pop. Turn off the heat and add the seasoning to the Rasam. With what do you eat this or is it only a drink. Ambu, this tastes good as a drink and as well with rice. This is one of the variety of Rasam.